One of the oldest surviving lettuces from classical antiquity; it is depicted on wall paintings in ancient Egyptian tombs and mentioned as a medical herb by Greek and Arab physicians. Our strain was discovered in a monastastic garden in central Europe and is not generally available even to European seed collectors. This rare lettuce produces pointed plume-like leaves which are delicious in salads or as a cooked potherb. When the lettuce bolts to form flowers, it produces stems similar to asparagus in texture. This was once considered a prize vegetable and pickled in brine for use over the winter. 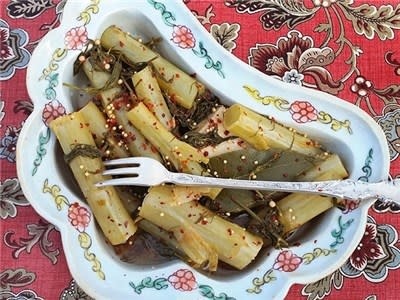 In Byzantine Greek cuisine, the pickled stems were served as meze, that is among the appetizers at the beginning of a meal. Plants grow about 36 " tall in good soil. Stems for pickling should be harvested before the plant sets flowers. Plant 15 inches apart for best shaped plants.